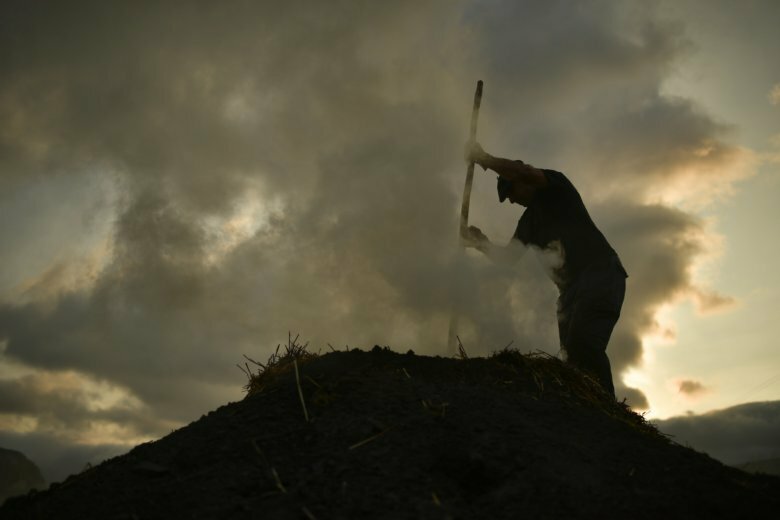 VILORIA, Spain (AP) — Even though he receives the occasional helping hand from his 22-year old son, Miguel Lander knows that the days of making charcoal the traditional way are counted in these remote valleys of northern Spain. Lander is among the handful of remaining professional “charcoal cookers,” the name given by locals to the backbreaking and painstaking process of turning firewood into the lightweight pieces of carbon. “One has to earn a living,” says Lander, 56. Amid changing lifestyles and competition from industrially produced charcoal, these days it’s only restaurants and private households that buy Lander’s few tons of fuel he produces every year according to centuries-old tradition. The future, as he sees it, is far away from the slow-burning, smoking firewood pyres. The carbonization of the wood comes from slowly choking the logs at a constant temperature, keeping most of the oxygen out. In Viloria and other hamlets in the shade of the limestone ranges of Loquiz and Urbasa, that’s achieved by covering pyramids of wood with hay, dry leaves and a layer of insulating soil. The fire is lit through a chimney in the center of the pyre. Lander then climbs up on a wooden step to dig air vents in the volcano-like structure in order to keep a steady combustion, which can go on for weeks. Nowadays, Lander “cooks” in each of these steaming hills around 1.5 tons of holm oak wood, the best for charcoal. He watches them day and night: if they burn too fast, all will be reduced to ashes, he says. But the size of these pyres used to be much bigger, according to Emilio Galdeano, 78, who began making charcoal when he was still a teenager. Galdeano abandoned the trade for two decades when he joined scores of other peasants who sought jobs in bigger cities. But when Basque steel mills downsized in the late 1970s, Galdeano returned to Viloria and its surrounding mountains to keep making charcoal. Charcoal pyres were part of the landscape, and mystery shrouded the charcoal makers who, before vehicles could bring the wood all the way down to the valley, spent weeks or even months up in the mountains tending the firewood piles. They were often perceived as sullen and solitary, but also central members of the community, providing a basic necessity. Perhaps that’s why the most famous charcoal maker in the Basque-speaking valleys is Olentzero, the Father Christmas-like, wine-loving mythical figure who drops off presents to well-behaved children — and leaves charcoal for the roguish — as he goes down the mountains at the height of winter.